How many hours a day do you work to support the persons and programs called the Government? How much of your time and life energy goes to fund faceless bureaucracies and the banking cartel called the Federal Reserve? 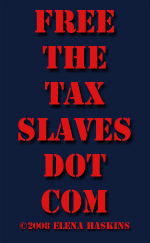 My name is Elena Haskins, and I have been a Tax Slave for most of my life. Even before I began paying taxes myself, I was worried about them. Beginning around 9 years old, when it was time to pay the property taxes, I watched my widowed mother bite her nails down so far they were bleeding. That became a yearly event. The taxes came due. Mom would chew on her nails. Her fingers would bleed. My father, Lt. Cmdr. Harry Haskins, had been killed "in the service of his nation". We were left to survive on the pension for widows and dependents, which was enough to survive, but not to thrive. Now I owe property taxes that are in arrears. I do not bite my nails. Instead, I get rashes. Meanwhile, I watch taxpayers being forced to give their life hours and life energy so the Professional Parasites who call themselves the government can give billions away in bailouts and inefficent, ineffective social programs and squander trillions in disastrous wars. Who were and are the humans who contrive and contrived to put the heavy burden of taxes on working women and men? And how do we get the Professional Parasites to cease and desist? not tax deductible for federal income tax purposes.